Today’s markets are saturated with numerous LED flood lights, which can be confusing to sift through if you aren’t sure what you’re looking for. This article dives into different types of LED flood lighting solutions for outdoor spaces and environments. LED flood lights, or luminaries that emit a bright beam with a maximum spread of 120°, are robust lighting systems for outdoor locations. Compared to spot lights, which come with a narrow beam configuration of 45° or less, these all-encompassing units are capable of lighting up wide targets with the same lumen output. The two most common options, when it comes to LED flood light foundations, include elevated and ground based. Lights on mast, towers or poles are examples of elevated lighting. Such units illuminate targets from 10-80 feet in the air. You’ve probably seen these massive systems at concerts, stadiums, docks, parks and streets. There are several advantages that come with elevated lighting positions. First, individuals are less prone to getting blinded by the lights, since the beams are not within their peripheral vision. In locations that experience high activity, mounted lights are less prone to getting stepped on. 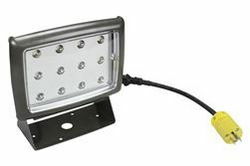 Ground-based LED flood lights are units that illuminate targets from the ground, upwards. These type of luminaries are perfect for walls (LED wall packs, for example), lighting up statues, gardens and walkways. They are best placed in locations away from busy operations, like behind bushes or on the boundaries of sidewalks. Additionally, ground-based LED flood lights are not ideal for illuminating outdoor locations with large crowds; since when pointed upwards, it can easily blind people. There are exceptions to this recommendation, such as outdoor stages that incorporate both types of flood lights. To automate LED flood light operations, one may consider the following features: dusk to dawn or motion sensors. Both functionalities are designed to turn the system on and off when certain outdoor conditions have been met. Dusk to dawn refers to a light that turns on when sensors sense nighttime or cloudy conditions and turn off during the day. This feature is best applied in places that need constant illumination, like road repair projects, emergency camps and military bases. Motion sensors are exceptionally suitable for locations that don’t receive a lot of foot traffic, but need to be lit up when it does. Dark walkways, outdoor garages that house expensive equipment or cars, storage facilities and outdoor delivery bays are examples of environments that could benefit from LED flood lights with motion sensors. By adding an extra layer of security (in the form of proactive lighting), individuals can pass through or work in the location with confidence. LED technology is capable of incorporating colors via a combination of RGB (red, green and blue) diodes, resulting in over 16 million (16,777,216 to be exact) different options. When it comes to white light, LEDs can also meet strict color temperature requirements. Choosing between colored and white LED flood lights comes down to personal preferences and aesthetics. Colored variants are great for mood lighting, when applied to ground-based systems (light masts rarely use colored LED flood lights). On the other hand, white LED flood lights do well in locations with high activity or for passive/background lighting. Low color temperature versions between 2,000K-3,500K may be used to promote a relaxing mood, while high color temperature models between 4,000K-6,000K are recommended for outdoor displays and locations where work is conducted. For safety reasons, one could install low voltage LED flood lights that operate on 12V or 24V, compared to standard variants that operate on mainstream voltage, such as 120V or 240V. Low voltage options come with an in-line transformer that steps down the voltage. Coming in contact with a low voltage current is significantly safer than a high voltage current. However, one major drawback with low voltage flood lights is the use of a transformer, which can serve as another point of failure (making the system more complex, thus more prone to maintenance). Taking safety into consideration, low voltage lights for outdoor applications are excellent for wet locations and for installations in places where the luminary could come in direct contact with people. Advancements in lighting technology have allowed luminaries to become more independent. Self-contained LED flood lights are units that are equipped with everything they need to remain operational. This could include a self-charging battery, solar panels, motion sensors and LEDs (due to their long lifespan of 50,000+ hours). Such lights are recommended for remote locations and for areas that are prone to emergencies or catastrophes. For instance, a self-contained LED flood light may be installed at a major exit point of a nuclear facility. In the event of an earthquake, power failure or a nuclear meltdown, the lights would be able to serve as a guide for workers evacuating the site.